Taiwan bans slaughter of cats and dogs for human consumption!! Home / Blog / Taiwan bans slaughter of cats and dogs for human consumption!! BBC reported on April 11, 2017 that the “Taiwan’s parliament has approved a bill banning the slaughter of cats and dogs for human consumption. The bill also prohibits those using a car or motorbike from pulling their pets alongside them on a lead as they travel. Anyone caught breaching the order faces a large fine or up to two years in prison – and having their names and photographs made public. The measures were introduced to improve the country’s animal protection laws. The move on Tuesday is a landmark amendment to Taiwan’s Animal Protection Act, and is the first of its kind in Asia.” Click HERE to read the entire article. Click HERE to learn more from the World Dog Alliance. 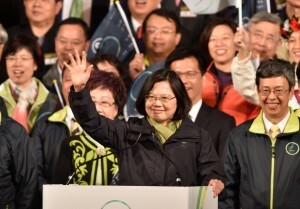 Taiwan’s president, Tsai Ing-wen, is the first female president of that nation and she used her leadership role to bring this important change to her country – to ban the slaughter of dogs. What a contrast to South Korea’s first female president, Park Geun-Hye, who abandoned her pet dogs – 9 Jindo dogs and puppies, when she was impeached for corruption and moved from the presidential palace. Japan – No dog consumption in their history. Hong Kong – 1950: Banned slaughter of dogs and cats. Philippines – 1998: Banned dog consumption. Thailand – 2000: Banned slaughter of dogs and cats. Taiwan – 2001: Banned sale of dog meat. However, the dog meat restaurants still operated. In 2007, Taiwan animal rights activists sued their government for not enforcing the laws banning sale of dog meat. We applaud these Asian countries for taking the initiative to put a stop to dog meat consumption, and we implore them to diligently enforce these laws. In Korea, no efforts had been implemented to stop the dog meat trade, because of profound indifference of the government and the majority of the citizens. It is time for these Asian countries to speak out against the dog meat trade, for the benefit of Korean animals as well as their own image. 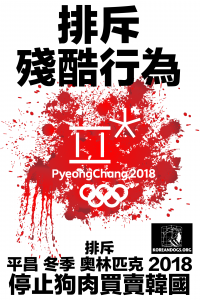 PyeongChang, host to the 2018 Winter Olympics – the world will be watching South Korea, which is why this is the perfect time for you take action to support our campaign to end the horrific dog and cat meat trade in South Korea for good! Click each of the Asian countries below to take action. Click HERE for complete list of NOC campaigns. very good news ! it starts my believing to the humans !!!! I personably have never approved of killing any animals for food. I think that it is inhumane and sadistic to torture any animal! I believe all animals have their own special qualities and should have rights under the law protecting them from any abuse! And these laws should be INFORCED!! All animals deserve better !!! Stop the torture and murder dogs and cats!!! NOT FOOD!! !